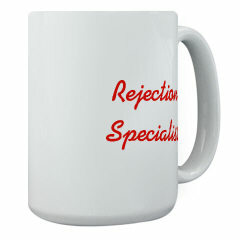 Our current featured product is the limited edition Rejection Specialist mug. Why give people false hope? Let them know that they don't have a chance faster than they can say, "Will you be my Valentine?" Just sip your morning coffee in this 15 ounce, dishwasher safe ceramic mug. Make sure you select and then "zoom in" on each product to see the unique rejectionline graphics. Please direct questions to info@rejectionline.com. Copyright 2001, 2002, Jonah and Chelsea Peretti, all rights reserved. Unauthorized commercial use of the "Rejection Line" or the rejection line concept is strictly prohibited. Non-commercial rejection lines are permitted, but please, make sure they are funny and not just mean. Send your rejection number and we will post it!